Is China’s BRI idea beginning to catch the world’s attention? Home /Asia, Belt and Road Initiative, China, China-EU, Economic Growth, International Relations/Is China’s BRI idea beginning to catch the world’s attention? Representing 25 per cent of the global population and generating one third of the world’s GDP, relations between China and the European Union (EU) are next in global significance only to those between China and the US. Bilateral trade has grown to such an extent that the EU is China’s biggest trade partner, while China is the EU’s second largest trade partner after the United States, investing around US$235 billion in EU countries whilst reducing its US investment to just US$103 billion in 2015–2016. The prospect of more Chinese leverage in Europe has made the EU somewhat unsure. Having had several opportunities for bilateral co-operation, this has been a viable and productive partnership. First off, the EU countries joined the Asian Infrastructure Investment Bank (AIIB) in 2015, even though the US showed reluctance. In return, China joined the European Bank for Reconstruction and Development (EBRD), and so working together is not something new in their bilateral relations. Consequently, it was considered likely that the EU would become part of China’s mega-project, the Belt and Road Initiative (BRI). The absence of any rivalry and a general convergence of strategic interests could have made a sustainable long-term partnership possible, especially as the EU did not feel geopolitically threatened by China. However, it seems that the prospect of more Chinese leverage in Europe has made the EU somewhat unsure, particularly keeping in view China’s growing economic presence in Central and East European countries (CEEC). Recognising the need for connectivity with Asia, the European Commission has instead gone ahead with a strategy of its own to create cross-border links, modernise transport and energy, and improve digital infrastructure links with the Asian continent. Releasing the policy document, EU Foreign Affairs representative Federica Mogherini said, ‘Our approach is the European Union’s way to establish stronger networks and strengthen partnerships for sustainable connectivity’. Increasing the EU’s external action budget to €123 billion for the years 2021–2027, the new strategy proposes to raise further money from the private sector and implement mega-projects in Asia. Seeking to benefit countries both at the ‘end-point’ and in areas of transit, the focus is on speeding up investment and innovation. 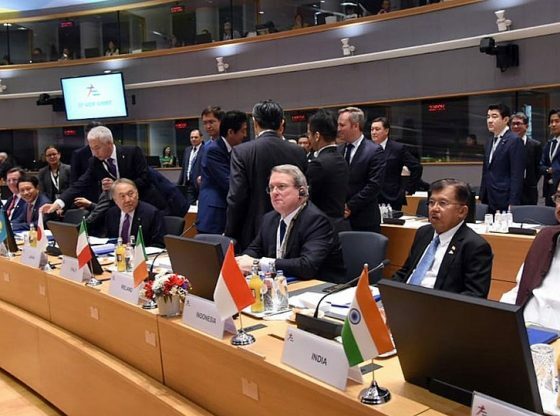 A further strategy was unveiled in October at the inter-governmental Asia-Europe Meeting (ASEM) for 53 countries in Brussels. Pledging to remain engaged with China, the EU made it clear in a press release that it would make sure that systems and networks would be inter-operable and that the initiatives of both China and the EU would work with synchronicity. Presenting an opportunity for cooperation in line with the Belt and Road Initiative, construction of ‘the European way’ is not a direct counter to the BRI. Instead, this new venture seems to symbolise that Europe wants to tackle and execute the project independently, according to its own terms and conditions. Though it may seem that Europe is putting up a contender initiative to the BRI, the reality could still prove quite different. More infrastructure plans are exactly what Asia has needed for decades in order to be on a par with developed countries. Such new ventures highlight that planning the BRI was timely and beneficial from both the regional and global perspectives. Being the fastest growing economic region in the world today, Asia requires a yearly investment of no less than €1.3 trillion ($1.5 trillion) to bridge its infrastructure gap. Providing significant opportunities for European companies, this development venture makes sense, as the Trans-European transport network requires €1.5 trillion in the years 2021–2030. For some time, European Commission President Jean Claude Juncker’s Juncker Commission has been focusing on the field of infrastructure, recommending that a climate of entrepreneurship is the only way to bring back jobs, investment and growth to the EU. Thus, pitching in and investing on infrastructure and trade connectivity works for both the EU and Asia. Ostensibly, plans have been underway since 2016 to engage with Asia, according to the EU’s Global Strategy: a ‘connected Asia’ covers political and security matters as well as trade and investment. Being a ‘rising continent’ due to its massive population, it remains the world’s biggest market for showcasing products. In the meantime, the US is also planning to follow the Chinese example by launching its own infrastructure mega-projects around the world. Offering developing countries alternative financing options for much-needed infrastructure, preparations are being made to finalise funding arrangements. Working to resolve any barriers, the US Congress plans to pass a bill through the Senate for facilitating ‘international development’. Having almost wound up the Overseas Private Investment Corporation (OPIC) in 2017, which promotes US investment abroad, this development represents a sharp U-turn in strategy. Additionally, a new agency – mainly based on the popular OPIC pattern – would run several international development programmes. Summing up, it appears that the BRI idea has been a success, and various geopolitical and geo-economic factors have prompted more global powers to follow suit. In the long run it will be beneficial for all as it helps to reduce the poverty and infrastructure gap in developing nations and works for the betterment of mankind. Sabena Siddiqui is a foreign affairs journalist and Sinologist focusing on the Belt and Road Initiative, CPEC and South Asia. She also works as an op-ed writer at China.org.cn, South China Morning Post and Asia Times. Find her on Twitter @sabena_siddiqi. Image Credit: CC Wikimedia Commons. On Thailand’s election: left foot first or the right one?